Yellowstone National Park is the country’s oldest National Park, signed into law by Ulysses S. Grant in 1872, 40 years before the National Park System was created. It continues to draw millions of visitors a year with its spectacular geothermal features, abundant wildlife, and breathtaking views. There’s no wonder that this American gem is the most visited National Park by RVers in the United States. Let’s look at the accommodations offered by Yellowstone to RVers and tips and tricks on getting the most out of your visit to this scenic territory. Yellowstone National Park is one of the most visited sites in the world. Sitting on top of a super volcano, this National Park boasts some of the most beautiful geysers in the world. Old Faithful, one of the most active and popular geysers in the park, is a sight to see. 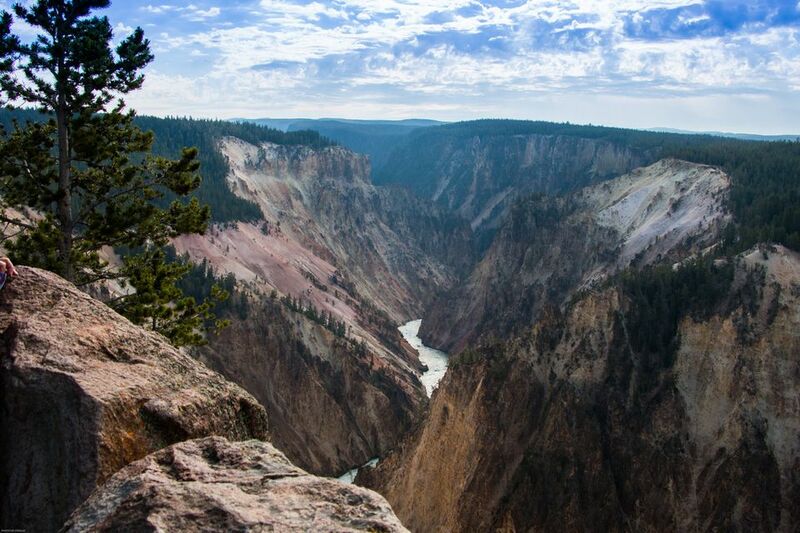 President Ulysses S. Grant declared Yellowstone a National Park in 1872. A wide range of ecosystems exists within the park, as well as geothermal features studied worldwide. Settled by Native American tribes over 10,000 years ago, Yellowstone is one of the largest areas of land under National Park Service jurisdiction. Read More: Learn more about Yellowstone National Park by visiting the National Park Service’s website. Bridge Bay Campground is 30 miles from the East Entrance to Yellowstone and close to Yellowstone Lake. It is an excellent campsite for fisherman due to its proximity to the Bridge Bay Marina on Yellowstone Lake. There are dumpsites but no utility hookups. Canyon Campground is in the heart of Yellowstone and less than a mile away from the Grand Canyon of Yellowstone; this site offers a gateway to all parts of the park nestled in a quiet forested backdrop. Canyon is also close to many park amenities such as food, gas, and a maintenance shop but does not include utility hookups. It does, however, include a dump station. Grant Village Campground offers quaint grounds tucked into the southwest shore of Yellowstone Lake and are only a few miles from the West Thumb Geyser Basin. Grant Village is also near several trailheads that snake around the different geothermal attractions. Grant Village is less than a mile from RV dump stations, showers, and stores, along with a dump station, but does not include utility hookups. Madison Campground is near the Madison River, and the confluence of the Madison, Gibbon and Fire hole rivers, this site offers up fantastic fishing. Madison is located 14 miles east of the West Yellowstone entrance and 16 miles north of Old Faithful. Madison is also not far away from the Upper, Midway, and Lower Geyser Basins. No utility hookups provided but dump stations are available. Fishing Bridge RV Park is the only Yellowstone operated RV campsite that offers full utility hookups. Fishing Bridge is located near the mouth of the Yellowstone River and is a great site to go bird watching. RVs and travel trailers are limited to 40’ at Fishing Bridge. All these campsites can be booked through Xanterra Parks and Resorts. It’s best to book an RV parking spot at Yellowstone well in advance, even up to a year to ensure the best possible location for you and your family. What's stopping you from visiting one of the most popular National Parks in the world? Book today! Every trip to Yellowstone must include a visit to Old Faithful. Once you get that out of the way, you can explore everything else the park has to offer according to what you like to do when you travel. With nine visitor centers across the park, you’ll stumble upon the history and culture of the park wherever you go. Historical and educational tours are available, but they fill up quickly so book a time before you arrive. Horseback riding, hiking, fly fishing, kayaking, and rock climbing are available. There are front country and backcountry routes to take to get to everywhere you’d want to go. Pro Tip: Make sure to plan your daily excursions well. Millions of people travel to the park each year, so it gets crowded. By planning your days out, you’ll get to do and see what you came there to do while others scratch their heads because they didn’t think to plan. To get the most out of your trip, it’s essential to pick the best time of year to make it. Most of the best RV sites at Yellowstone don’t open until late spring and early summer and begin to close their gates around early September. The busiest times of the year are the middle of June through the end of July. If you prefer the colder weather to crowds, it is best to go at the earliest and latest parts of the season. If you want perfect weather and are comfortable with a busy park, it’s best to visit end of spring, beginning of summer. Book your trip up to a year in advance to guarantee RV parking at Yellowstone National Park for your next road trip adventure.